You are an Archon. Hailed by some as a god, respected by others for your wisdom, you were born-or perhaps created-on the Crucible, a world in which anything is possible. The Crucible is ancient, but ever renewed. An artificial planet hanging in the center of the universe, the Crucible's many layers remain constantly under construction by the enigmatic and mischievous Architects. For raw materials, the Architects have harvested countless worlds, blending them into a new whole both familiar and alien to the creatures that dwell there. Whether lone specimens or entire cultures, the beings brought to the Crucible find themselves in a strange wonderland with no obvious means of returning to their former homes. Some thrive, building new societies and developing new technologies with the aid of the mysterious psychic substance known as Amber. Some discard the trappings of their old lives, adopting the ways and customs of new tribes discovered in this new world. Others devolve, bodies and minds twisted beyond all recognition, incorporating Amber into their very bodies. As an Archon, you have gathered followers in your journeys throughout the Crucible, allies who find value in your ageless wisdom and your ability to speak to all creatures. With the aid of these allies, you seek out Vaults hidden throughout the Crucible by the cryptic Architects. Each Vault can only be unlocked by Amber-forged keys. Once open, a Vault's contents-the power and knowledge of the Architects-can be consumed by only a single Archon. 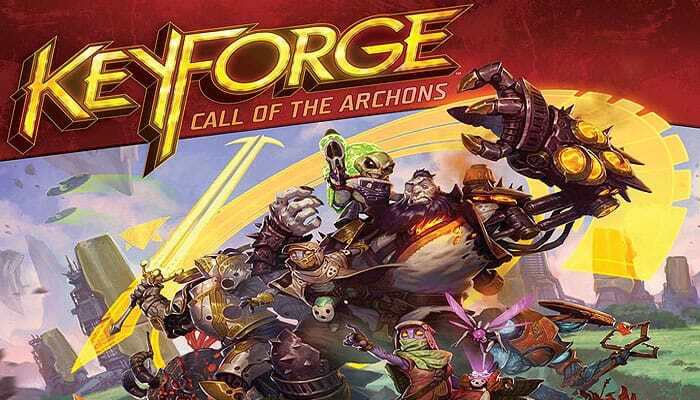 KeyForge is a two-player card game in which each player takes the role of an Archon, and leads that Archon's deck against their opponent. A player's deck represents a team that is attempting to gain ^mber and forge keys. The first player to gather three keys is able to unlock a Vault and win the game. The defining feature of KeyForge is that no two decks are alike. This is not a trading card game-you cannot craft a deck. Rather, each deck is must remain as it is. Every deck in existence is unique! The components included in a KeyForge: Call of the Archons starter set are pictured here for identification purposes.